Killeen Police need to identify a person who was seen stealing a car on camera. Officers were contacted by a male on Sunday, September 25, 2016, at approximately 8:30am, that his vehicle was missing from his driveway. The victim advised he had cameras at his residence and after looking at the footage, he saw that a black male, possibly in his 20’s, with long hair and a goatee, wearing a white beanie cap and a long sleeve shirt. The male entered the victim’s black 2013 Ford Edge SUV and drove away. The vehicle was seen being driven on Wednesday, September 28, 2016, in the 3300 block of E. Rancier, but the driver was able to flee the area. Officers located the vehicle unattended in the 2800 block of Tucker Drive a short time later. 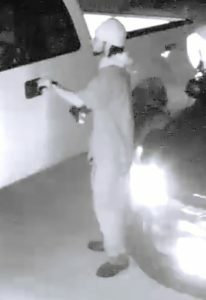 Detectives are asking if anyone can identify this vehicle thief and if so they are asked to contact Crime Stoppers at 254-526-TIPS (8477) or go online anonymously at www.bellcountycrimestoppers.com. You can also download the P3tips app for IOS and Android and give an anonymous tip with your mobile device. All information is anonymous and confidential and if your tip leads to the arrest of the person responsible for this Theft, you could be eligible to receive an reward up to $1,000 in cash.